Brock Murray is a digital marketing specialist for seoplus+. His unique ideas and passion for all things SEO-related have helped hundreds of SMBs establish and maintain their online presence. I want you to think about everything you know about search engine optimization (SEO). Every little tip and trick you’ve been taught, all that niche vocabulary you picked up, every “best practice” you’ve memorized and absorbed. Now realize that, in the time you took to read that last sentence, SEO’s goal posts have moved and your information is suddenly out of date. And – there they go again. SEO is an ever-changing field, and if you’re not ahead of the game you’re behind. For that reason, it’s more important than ever to be forward-thinking and proactive with your SEO strategies. As we stand on the brink of a new year, there’s no better time to evaluate the state of SEO and start strategizing for the evolution of search and preparing for the new wave of search engine algorithm updates. Let’s get this out of the way first: yes, the next Penguin update is coming soon. We don’t know when, and we don’t know exactly what it will entail. As with any other major Google algorithm update, what we do know is that it has the potential to turn everything on its head. Websites that were beasts but got penalized will have a chance to jump back into the market, so expect to see stiff competition no matter your niche. At the same time, expect to see big players fall victim to the latest update. The most interesting development is the “real-time” nature of algorithm updates in 2016. SEO Manager Graeme Kahn looks at this as a positive – if you get a penalty with either Penguin or Panda, you can just make adjustments and remove the penalty by the next day. Penalized sites currently have to wait for the next refresh to remove their penalty, so recovery will be immediate in 2016. It’s interesting that Graeme brings up Panda, because Internet Marketing Consultant Charles Floate has the same concerns. Charles explains that with Penguin, you should be safe with backlinks on good domains as long as you don’t have over-optimized anchors, even if the writing quality is very poor. With Panda, on the other hand, these pages are viewed as “non-valuable.” If enough of these substandard pages link to you, your link profile becomes toxic. Charles’ concerns are justified, and it will be interesting to see if people finally embraced the oft-repeated (yet rarely applied) mantra that quality is everything. Google is prioritizing user experience, and accordingly you best believe this will be a huge SEO priority in 2016. I’ll give you an example of a term that is extremely relevant, but that we don’t hear talked about much. Google Penalty Expert Marie Haynes talks about the Pogo-Stick Effect, which goes hand in hand with a high bounce rate. Basically, you’re able to rank your page in the SERPs, but visitors are leaving your site right away in search of something else. Maybe you didn’t solve their problem, maybe your site took too long to load, or maybe it was just plain U-G-L-Y. Click-Through-Rate (CTR) is as important as ever, but if you can’t get those visitors to stick around, Google is going to recognize that your site isn’t up to snuff and adjust the rankings accordingly. I can’t emphasize how important this will be going forward. Searchers want access to accurate information right away in a digestible format, and if they can’t find it they’ll go elsewhere – even if your page ranks above the competition in the SERP. And rest assured you won’t stay ahead for long if the pattern repeats. The solutions may seem obvious, but you’d be amazed at how many millions of sites out there don’t meet basic standards for user accessibility. Target precise keywords and learn to love the long-tail. Put all your energy into simple design, fast loading times, strong calls-to-action (CTA) and focused, targeted landing pages. Not only is there elegance in simplicity, there’s dollar signs. 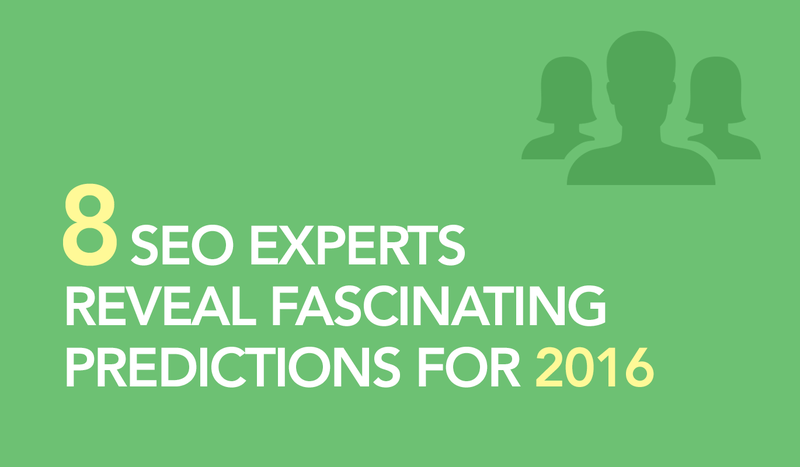 Backlinko founder Brian Dean agrees: “user experience will be HUGE in 2016. I’ve run a few experiments this year and there’s no question that Google is paying more and more attention to how people interact with your result. In 2016 it’s important that you consider “time on page” a super important SEO factor. Otherwise, you won’t last on the first page for very long.” I love the way Brian phrases this…if you don’t optimize for longer and deeper site visits, your time on the first page of the search results will be painfully short. [/row]Marie Haynes is thinking along the same lines. “My buzzword for 2016 is ‘usefulness.’ In the past, we used to be able to find all sorts of tricks to help a website rank well. But more and more, as Google learns how to produce results that users want to see, the sites that are ranking well are the sites that are the most useful. Here again, we return to the absolute, inescapable importance of producing quality, authoritative, original content. Give users information they can’t get anywhere else, or present it in a superior format to everywhere else online. Provide exclusive value and prioritize usefulness above all. It’s crazy to think that a year ago, you could have a junky non-responsiveness website and get away with it. That all changed with Google’s mobile-friendly ranking algorithm launched on April 21, 2015. In May 2015, Google announced that more searches were taking place on mobile devices than on computers. All this to say, the decisive shift to mobile is no longer speculation but an undeniable fact. In 2016 SEO strategies will have to adjust even further to accommodate the continuing change in user behavior. RustyBrick CEO Barry Schwartz places an emphasis on mobile in 2016, and rightly so. One key area he highlights is the growing importance of app indexing to drive re-engagement to deep inner pages. Barry also mentions that we should keep an eye on Accelerated Mobile Pages (AMP) – publishers using AMP pages will see much faster load times on mobile devices. Graeme Kahn concurs. He predicts that “around February 2016 we’ll see fast-loading through AMP, based on pulling data from cached gstatic pages instead of hosting websites. Mixing schema data and AMP data will become a big thing as Google has been running tests throughout 2015 loading desktop and mobile pages under 0.5 seconds using these technologies and HTTP/2.” All of this ties back into the emphasis on user experience and delivering a great product as quickly as possible to the searcher. He also predicts a greater divergence between mobile and desktop searches, so definitely keep this in mind. Graeme Kahn says “no more keywords. Keywords will be replaced with Topics. See Google’s Patent US9053156.” Though he predicts a timeline of 1-3 years, Graeme expects that keyword searches will become less and less prominent, as query string searches over take their place. This follows the general trend of users asking longer and more specific questions in search queries rather than searching for a broad topic. Google will focus more on topical and contextual relevance than straight 1:1 keyword matching. Graeme points out the rise of voice search and image search, which will only become more prominent in 2016. These innovative methods of search combined with advancement in machine learning signal the death knell for keywords as we know them. Ahrefs Head of Marketing Tim Soulo agrees, and zeroes in on Google’s improved understanding of searcher intent as the key. “The ability to predict searches and perfectly address searchers’ intent is what Google keeps getting better and better at. [/row]This might seem overwhelming – how do I target every variation of every possible search query related to my niche? – but it’s actually a liberating development. If you truly understand your target demographic, now you can focus on creating great content that addresses the pain points of your intended audience and provides the answers to their questions. I’ve weaved the importance of quality content creation throughout the other points, but this will be such a significant consideration in 2016 that it deserves to stand on its own. As Google’s algorithm gets closer and closer to mimicking human thoughts (three cheers to RankBrain and all of the monumental improvements to machine learning we witnessed in 2015), the more essential it becomes to craft content that truly appeals to humans. Webris founder Ryan Stewart has long been a champion of creating and promoting valuable content, and he continues to spread the good word. “I think it’s going to be interesting to watch how SEO providers approach content creation – I really believe content quality will play a bigger factor this year. I’m not just talking about blog content, but content that truly matches up with what searchers are looking for. For example, in competitive spaces like legal, did you take the time to build out the necessary support pages? If I’m looking for an attorney, I want to see case studies, in-depth information on the cases you take on, a resource page, reviews, etc. [/row]We’re talking 20+ pages of well-written and focused content.” Ryan also notes that creating content like blogs, videos, and guides with an eye to generating inbound links will become increasingly important in the coming year. As far as I’m concerned, having an active blog page with interesting and unique content is a great start, but it’s only a start. What I really expect to see in 2016 is a growth in ordinary businesses taking content creation to the next level. I want to see bakers offering seasonal cupcake recipes as a free e-book download. I want to see an insurance broker doing a slideshow of the top 10 most stolen vehicles. I want to see a plumber put together a video series of easy DIY fixes. [/row]You’ve got the knowledge, now it’s about demonstrating your authority and share that information in an engaging and digestible format. Then we get into content promotion – more on that below. In my conversations with eight of the most well-respected SEO minds out there, I was a little surprised that none of them brought up the increasing importance/power of social automation. Here’s the thing: content is nothing without content promotion, yet content promotion is painstakingly tedious, inflexible, and un-scalable unless you involve automation. In 2016, I think we’ll see more inner linkings and connections between various sources using APIs and popular automation services like IFTTT. This will allow websites to expand their reach by automating tedious and time-consuming tasks such as posting at specific times and intervals on all the major social networks. Social signals are an underrated ranking factor and they’re only going to be attributed more weight as we embrace the shift to mobile and the new breed of social networks starts to take root. Authority is no longer judged simply by numbers/volume. It’s also highly based on historical considerations (ie: age and reputation). Put simply, you don’t know if Periscope, Meerkat, and Blab are flash-in-the-pan networks or if they will become dominant. Get in early, flesh out your profiles, and start building your base on these platforms, because the results could be quite favorable for your brand in the long term. My final point may be a controversial one, but despite our own best interests I think it carries some weight. Business owners who have previously invested in SEO before are going to take a DIY approach. Maybe they were burned by an SEO huckster who talked a big game and failed to deliver, maybe they just weren’t willing or able to pony up the budget for a well-reputed SEO provider, or maybe they just have unrealistic expectations. Regardless of the motivating factor, business owners are going to seek out SEO information online, implement their own practices, and invest in different tools to simplify and streamline the process. This shift presents a really interesting opportunity for SEOs to get ahead of the game and sell their knowledge rather than their labor. There is room to produce courses (long-form and mini), webinars, videos – anything easy to follow for people to learn about SEO and begin to apply it for themselves. They will also be seeking out SEO-related tools (Ahrefs, SEMRush, Majestic etc. ), and I think these providers will all continue to add various features and assets to their product lines to accommodate this DIY growth. It’s amazing how quickly things change in the world of SEO, but I’m encouraged by the state of things as we prepare to ring in 2016. Google, SEO providers, brands, and users are closer than ever to a unified vision and we’re pretty much all on the same page: deliver a quality product with a focus on user experience, and you will prevail.